We provide full or partial load shipments throughout Europe, with many weekly departures to Belgium, Holland, Luxembourg, France, Germany. 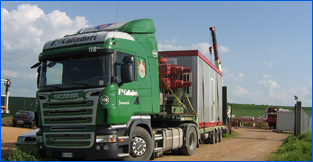 Ability to express deliveries with trucks or driving all over Europe for emergency loads. (Rendered in 24-36h). We have about 3,000 mq2 covered for the adjacent area for storage with loading and unloading area of 1 km from Cortemaggiore Fiorenzuola (highway A1 and A21). We also have over 20,000 mq2 open area for goods or equipment that do not require coverage. DLE is specialized in the logistics of sites in which you need to carry a large amount of equipment on short notice, given the presence of cranes for loading and unloading. DLE has more than 30 flat-bed trailers and 13.60 m 3 of low-bed trailer with ramps and has a large number of vehicles that provide the most comprehensive response to the customer. Ability to transport bearing test. Guaranteed to transport shipments of goods that use the air thanks to the availability of semitrailer equipped with rollers to allow the loading and unloading of aircraft pallets. We specialize in shipping containers arriving or departing by sea, we are active on the major ports and container in northern Italy. Possibility 'of ADR carry loads, with semi-low profile for HIGH CUBE containers with semi-trailers with electricity fridge for temperature-controlled containers.